Villa Ona sits right by Puerto Pollensa seafront, with magnificent views from the poolside over the water. The resorts' beautiful sandy beach is a short walk along the shore, leading to the restaurants around the centre, marina and Pine Walk. Plus, several alternative resorts, beaches and attractions are all within a short drive. The house itself is spacious, bright and furnished to a high standard. Air conditioning/heating in the bedrooms and WiFi are included. You'll love the prime seafront position and great views from the pool area - Villa Ona definitely stands out from the crowd! The private swimming pool and sun terrace face the sea, and are surrounded by glass panelling designed to make the most of the view and protect you from the wind. On one side of the pool is a pleasant chill out area, a pool table, table tennis table and the alfresco eating area. The brick BBQ is on the other side of the pool, by the entrance. The villa and pool area are gated from the street, where there is ample space to park your hire cars. A step up leads to the entrance at the front of the house. Inside, Villa Ona is spacious, fresh and colourful. As you enter the villa you'll see the fully equipped kitchen on your left, which has everything you need for a relaxing holiday. Steps up lead into the living area which has comfortable seating, a flat screen TV and a table and chairs, with views over the pool to the sea from the patio doors. A corridor which runs along the length of the living area leads to the bedrooms. There is a WC, a single bedroom, a double bedroom and a twin bedroom. On the other side of the twin bedroom is a second hallway with 2 shower rooms and steps up to the remaining double bedroom. This bedroom has patio doors onto the pool terrace and can also be accessed from the lounge. The position of Villa Ona could not be better. The house sits right by the seafront in Puerto Pollensa, around 10 minutes' walk from the beach. The promenade, square, marina and well-known Pine Walk are all around 1¼ miles along the coast where you'll find a huge choice of shops and places to eat. Anyone with a hire car will also have easy access to Pollensa Old Town, Alcudia, the waterpark and a choice of golf courses and attractions. Puerto Pollensa (Puerto Pollenca) Square, or Plaza, is around 1¼ miles along the seafront from Villa Ona. The square holds a weekly market every Wednesday morning next to the church and has around 200 stalls selling everything from jewellery and clothes to fresh fruit and vegetables. You'll also find several gift and beachwear shops along the promenade and Pine Walk. This popular beachside resort has a huge choice of cafes and fashionable bistros overlooking the sea. Restaurants line the promenade and marina as well as the famous Pine Walk. You'll also find several good bars and places to eat in the square. One of the main attractions of Puerto Pollensa has to be its spectacular sandy beach. The amenities of the resort run parallel to the seafront so you'll have everything you need to hand for an enjoyable day by the seaside! 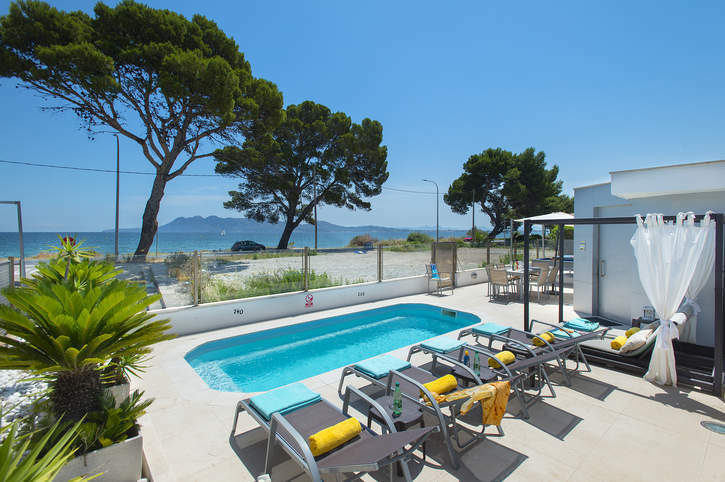 The neighbouring family resort of Alcudia has a waterpark, go-karting track and horse riding facilities. Pollensa (Pollenca) Old Town is around 4 miles inland of Puerto Pollensa and is well worth seeing. The town has a number of traditional Spanish restaurants as well as some beautiful scenery from the Calvary Church. Alcudia Old Town has a similar vibe, with views over the town and local area from the top of the surrounding medieval wall. Further afield you can see Europe's largest underground lake at the Caves of Drach, or enjoy a day trip to Palma. Continue past Pollensa Old Town and you'll come to the popular Golf Pollensa golf course, around 7 miles from Villa Ona. A second course, Golf Alcanada, can be found around 25 minutes' drive away on the far side of Alcudia. Water sport facilities are on offer by the beach. Or, if you prefer something more laid back, cycling and walking are a popular and great way to see the areas' beautiful local countryside and nearby S'Albufera nature park. Villa Ona is not available to book for season as it is sold out. Take a look here at the Majorca villas that are currently on sale. The municipal sports centre in Alcudia is a modern complex built in the early 90’,s. This complex enjoys a full size indoor swimming pool, Gymnasium, sports activities, squash and paddle courts. Spacious and well appointed villa. The condition of the villa overall was extremely good. Wi-Fi worked well - so happy teenagers and the satellite tv had plenty of English channels. The villa was lovely and spacious. Overall, the villa was great and the location was wonderful. We had a lovely holiday - the owner also visited and left flowers. Excellent service all round. This was our first villa holiday and would highly recommend your company. We found everyone and especially Jo the rep, very helpful, friendly and responsive and we were impressed with Jo's local knowledge. The villa was fantastic and we had a really lovely holiday, thank you!